A bicycle tyre has 4 basic components. The tread, sub tread, casing and bead. This is the part that locks the tyre into the rim when inflated and there are basically 4 types. 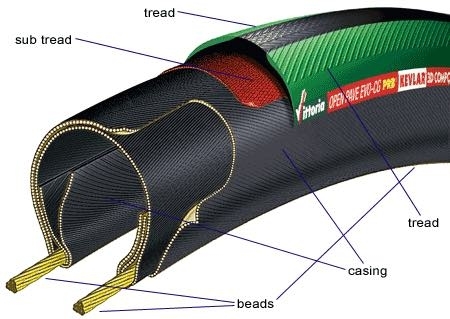 Tyres with beads form the majority of bicycle tyres and have traditionally been referred to as clinchers. Tyres without beads are not used commonly and are called tubulars. Wire Bead: this is the cheapest and heaviest. The bead is made from steel wire and the tyre cannot be folded. Kevlar Foldable: Kevlar beads are more expensive to manufacture than steel , but save weight and are still very tough. They are also generally easier to fit than wire bead tyres. Tubeless Ready (TR): Similar to kevlar foldable, but with the rubber around the Kevlar Bead shaped in so that it creates a seal against the rim when inflated. TR tyres need to run a liquid sealant to ensure they remain tubeless. Ultimate Sidewall Technology (UST): A UST bead is much the same as a TR bead, except the bead is shaped to perfectly match a UST specific rim. This set up is so solid, you usually don’t need any tyre sealant. This system has largely been replaced by TR due to sthe significant weight savings.